6.5 Creedmoor (right) shown with .308 Win (left) and .243 Win (center) for comparison. Though most popular for competition applications (PRS and XTC), the 6.5 Creedmoor is also a capable hunting cartridge. This month Norma spotlights the 6.5 Creedmoor cartridge and outlines the game-harvesting capabilities of Norma 6.5 Creedmoor factory ammunition. Dave Emary, senior engineer at Hornady, asked fellow competitive shooters about their “wish list” for a mid-sized round with long-range potential. It needed to offer efficiency, good ballistics, fine accuracy, and reliable feeding from a magazine. To achieve these goals, Emary necked the .30 T/C to .264 caliber (6.5 mm). The shoulder on this case is well to the rear, so long bullets with high ballistic coefficients can be used in short actions. The efficient Creedmoor case and its modest powder charge deliver hard hits on big game while keeping recoil modest. I learned about the 6.5 Creedmoor by way of a rifle from Todd Seyfert at Magnum Research. The Remington 700 action wears a carbon-fiber barrel with a Krieger stainless core. GreyBull Precision added a stock and a modified 4.5-14X Leupold scope. Its 1/3-minute elevation dial is calibrated specifically for 130-grain boat-tail spitzers at Creedmoor velocities. “Spin the elevation dial to the distance in yards, and aim dead-on.” said GreyBull’s Don Ward. Prone with a sling, I was soon banging steel at 500 yards. By the charts, the 6.5 Creedmoor is a superb cartridge for deer-size game. But I caught only a late elk season with this new rifle. 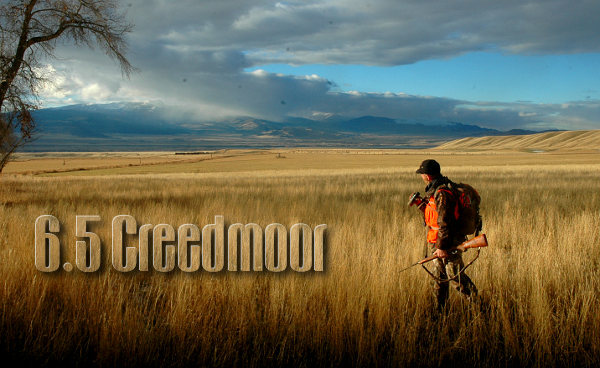 The 6.5×55 and .260 had taken elk for me; surely the Creedmoor would as well. Alas, the close shot I’d wanted, to ensure precise bullet placement, didn’t come. When on the final evening Don and I spied a bull far off, there was no approach. “Your call,” he shrugged. “The air is dead-still.” I snugged the sling, prone, and dialed to the yardage. Ribs spot-lit by a sinking sun, the bull paused. Craaack! The animal spun, sprinted and fell. That shot was twice as long as any I’d ever attempted at elk. Whitetail hunting with a Ruger 77, then a trip to sub-Saharan Africa with a T/C Icon, kept the 6.5 Creedmoor in my ammo pouch. The T/C dropped a Vaal Rhebok at 250 yards, in stiff wind (photo below). Shorter pokes on a variety of game produced consistently quick kills. 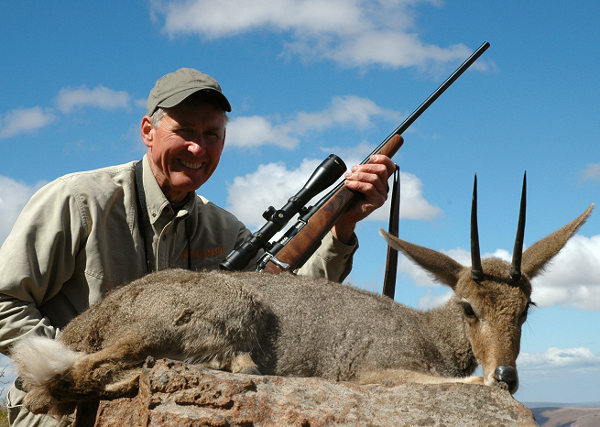 I found the Creedmoor’s limit with an eland. A high ballistic coefficient helped a Creedmoor bullet slice stiff wind 250 yards to this Vaal Rhebok. Since then, I’ve seen several animals brought to bag by the 6.5 Creedmoor. And I’ve used it in a variety of rifles on paper and steel targets to 1,200 yards. It has become one of my favorite cartridges for deer-size game. Its mild report and recoil make it easy to shoot accurately. It seems an inherently accurate cartridge too. I’ve punched half-minute groups from production-class rifles. The proliferation of hunting loads for the 6.5 Creedmoor includes none better than Norma’s 130-grain Scirocco. This sleek, polymer-nose bullet, with its 15° boat-tail and a G1 ballistic coefficient over .550, flies very flat. In expansion and penetration tests, it opens reliably down to 1,750 fps, and drives straight and deep. A bonded bullet, it stays in one piece after high-speed impact, routinely retaining more than 80 percent of its original weight. Story Tip from EdLongrange. We welcome reader submissions. 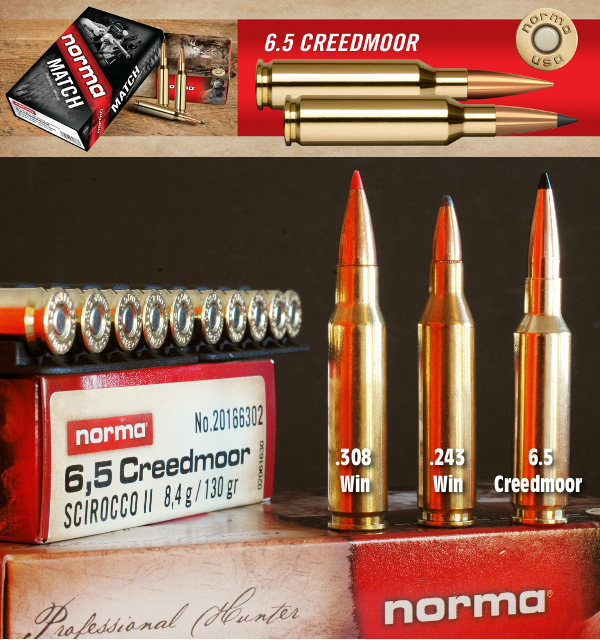 Share the post "6.5 Creedmoor — Norma’s Cartridge of the Month"